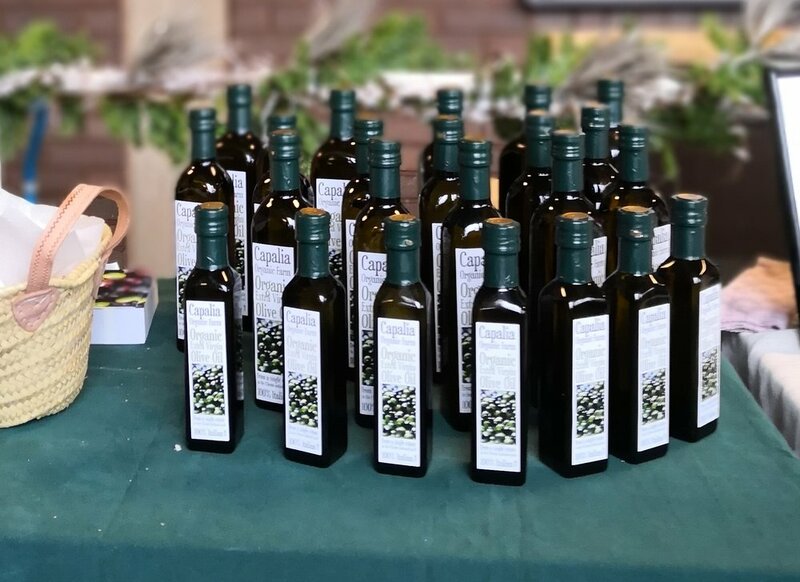 Our organic extra virgin olive oil is special because it comes from only one source, our own trees on our estate. We pick the olives with the help of Tonino, who helps on our land, and usually an extra pair of hands of a local labourer to alleviate the work. As our olives are organic we pick early in October to avoid the bugs spoiling the crop. This means our yield is pretty low, but the oil that comes out is tart and fresh with a little kick in it from the almost underripe fruit. Our olive picking is not a large industrial production. We love and use abundant amounts of it ourselves and appreciate that this simple golden liquid is a delicious addition to healthy and tasty way of eating. Some oils can be tainted with mixtures of oils of unknown provenance and nasty chemicals. We keep it simple and small scale. Our oil is our crushed olives and that's it. During the rest of the year, the land is fallow, kept tidy and free from long grasses by Tonino’s roaming sheep who live most of the year on our land. The trees are pruned once every couple of years to make sure they retain their shape. Although we care more that they look nice rather than making them olive producing machines, particularly around the house. A typical olive picking day starts early. At 7:30am you can hear the unmistakable engine sound of the ‘cippappá’ (local name for a rickety agricultural vehicle) as it chugs up the hill to the site of the day’s work. You wolf down your breakfast and rush to join them. The first task is to lay nets under a couple of trees and stick in poles or tie the net to a nearby fence to create a bucket shape under the tree that will collect the olives as they come careering down. The hydraulic comb attached to a generator ‘combs’ the olives off the tree and they fall like little missiles into the net underneath. Sometimes you have to hold the net high to catch the falling fruits and although you get pelted with sharp little projectiles there is satisfaction in knowing that you got them into the net. The reality is that the generator pumps away all day and the beautiful silence of the countryside is lost. Once the tree has been combed of all olives, the comber starts on the next tree and everyone else scoops up the olives from the net and fills sacks or crates. They must then move the nets and prepare the next tree for picking. And so the wheel keeps going. The work is methodical but fast. No time to pick up lost olives or sit contemplating the countryside, the machine is loudly pumping, the next olives are falling, and the bags must be filled so that the next tree can be chosen and readied. A mid-morning coffee break is always welcome and often Tonino has brought a little bottle of very sugary espresso that he hands out. The mark of extra virgin olive oil is low acidity. Anything between 0.1 and 0.8 acidity is ‘extra virgin’ – our oil is on average 0.2. The Cooperativa Nuovo Cilento in San Mauro is our local organic press or frantoio and they work way into the night during the picking season as olives from all over the area come in to be crushed. The olives are first sprayed clean and the leaves and twigs are removed. The olives are then crushed into a pulp and this mixture is gently stirred and all the liquid is squeezed. In the final process, oil is separated from water through a centrifugal machine. The frantoio at San Mauro has state-of-the-art olive presses that keep the temperature of the oil low as the pulp is crushed and pressed. This is what is meant by cold pressing, as the mixture, which will tend to heat as it passes through the machinery, is kept cool. So, olives with no pesticides, olives that have an almost immediate transfer from tree to bottle and all from one small organic farm in the beautiful Cilento. The sweet smell of the crushed fruit mingles with the cold air of an autumn night in the mountains and it is exciting to watch your own golden liquid pour out. Our farm has been certified organic since 2006, a process that took some time and much complicated Italian beaurocracy, but has been worth it. The land is now rigorously controlled annually by the Italian ‘controllo biologico CEE’. This is the Italian version of the British Soil Association and its logo can be seen on our bottles. Extra virgin olive oil is defined by the low level of acidity. It has to contain less than 0.8% acidity to be called extra virgin oilve oil. Once the olives have been pressed the acidity is checked there and then in the frantoio. It is a tense moment but ours is generally well within range at about 0.2%. Acidity can be controlled in various ways, principally by picking early in the season as this avoids overripe olives and reduces the risk of the fruit being infected with fly larvae. Reducing the time between picking and pressing is also vital as this leads to fermentation. Ideally the olives are picked during the day and are pressed that same evening. The picking goes on until about 4pm and then we all return to the house for a small rest. Dominic and I have a nice cup of tea, and although our Italian co-workers don’t really quite get it, they will often join in with our quirky ritual. The others go home at this point, but we must take the olives up to the mill and wait for them to go through the press. We load the landrover with up to 500kg of olives and drive to the local Cooperativa di San Mauro. It is important that the olives are pressed that same day as this is one of the factors that ensures good quality, low in acidity, extra virgin oil. To buy some oil, or for information about olive picking holidays or just to find out more, please send us an email.